Emma Jacks, a ten year old schoolgirl has an exciting secret. She has a secret identity, EJ10, and is a spy in training with the Shine Agency. At spy school she learns about breaking codes, following clues and other skills a good spy needs. In Puppy Alert her training is especially fun. EJ10 is learning about animal rescue. And it is a thrilling lesson, following clues around the giant indoor training centre at Shine Headquarters. Her mission is to rescue five hidden puppies. 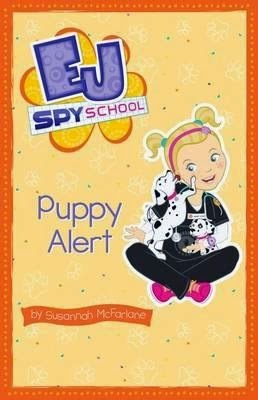 Puppy Alert is part of the EJ Spy School series, written for beginner readers based on a McFarlane's well established and popular EJ12 Girl Hero series. This younger version goes back two years earlier, to when Emma was recruited and trained for work in the Shine Agency. The EJ Spy School series incorporates large, easy font, short chapters, subjects which appeal to young girls and simple story lines which take place over a short time period, all features which make this series a good starting point for beginner readers who would like to join in EJ12's exciting world of missions, adventure, fun and animal rescues. The illustrations are sweet and do more than just decorate and break up the text for easier reading. They also work with the text conveying meaning not stated in words. This helps to build a bridge between picture books young readers are used to, and the chapter books they are striving for.